Knuckle Sammich: A Kobolds Ate My Baby Game Review — GamingWithSwag.com - Dads By Day, Gamers By Night. Every once in a while, there comes a game that redefines gaming. A game so smart in its simplicity that one would be amazed a game like it had never gotten made before. A game so incredibly intuitive and exciting that it’s only a matter of time before it takes the world by storm, slaying every other board game mainstay in a whirlwind of blood and fury, till it alone sits upon a throne made from the corpses of all the Catans and Ticket to Rides that came before it! This is not that game. This is, in fact, a very stupid game. In Knuckle Sammich players are hungry kobolds bickering and brawling in an attempt to eat as many sammiches as possible. If you’re not in the know, kobolds are weird little goblin-ish creatures with voracious appetites and an appearance that resembles a half dog, half lizard, half man creature. On each kobold’s turn they draw a card from the "kitchen" (the deck), then play a card from their "paw" (their hand) onto their "plate" (in front of them). These cards do various silly things which usually result in someone eating a sammich or another kobold (which gives you a sammich). Most cards require you to do things like compare the card in your paw to another kobold’s, with the higher value card owner eating the lower or to guess the type of "meat" (type of card) in the paw of another kobold resulting in them being eaten or just giving them a sammich. Certain effects can also cause King Torg (ALL HAIL KING TORG) to eat a sammich. King Torg (ALL HAIL KING TORG), who is represented by a tile in the middle of the table, can actually win the game is he eats more sammiches than anyone else. 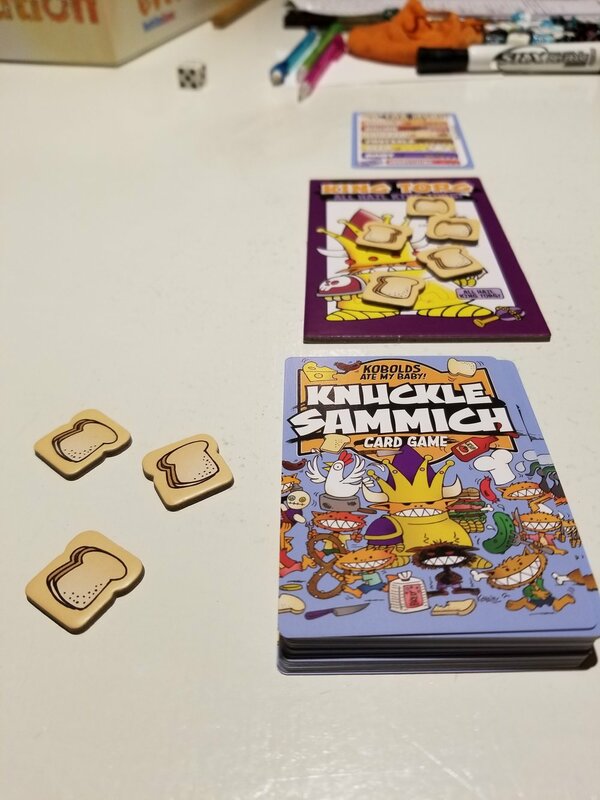 When the kitchen is empty, all but one kobold has been eaten, or someone play a card that says "end the round", the round ends and King Torg (ALL HAIL KING TORG) along with any surviving kobolds eat a sammich. If there are still sammichs left, a new round begins, otherwise the kobold with the most sammichs, or King Torg (ALL HAIL KING TORG), wins. I really enjoyed Knuckle Sammich. Even though it shares a common D.N.A. with some of the aforementioned banal exercises in gaming, it has some key points that set it apart. Since you only ever have two cards to play, the game moves swiftly with very little downtime or room for the dreaded analysis paralysis. This also doesn't let the joke wear out its welcome. Much like We Didn't Playtest This at All, the humor comes from the silliness and speed of the rounds rather than trying to beat a joke to death. Part of this charm also comes from the wonderfully goofy art, courtesy of John Kovileks of Dork Tower fame. For some reason the kobold’s expressions always crack me up. Keep in mind that even though I enjoyed this game, the actual game part is nothing to write home about. My game group was much less enthused by it then I was, citing randomness as a big turn off. If I have to be perfectly honest, we all had way more fun playing several rounds of Win, Lose, Banana afterwards, which may say something about Knuckle Sammich. While we're talking about negatives I'd also like to note that the rules are a mess. For such a simple game, I felt that things were worded in an obtuse way at parts and keywords were bolded and in another font, which was just distracting due to the sheer volume of them. All in all though, I enjoyed this game. It was a pleasant experience and I would definitely reach for this over any of its ilk (you couldn't pay me enough to even sit in a room with Munchkin...). If you like this style of silly, fast paced, beer-and-pretzels games, then this is a no brainer. Honestly, even if those games aren't you’re cup of tea but you need a fun filler, you might want to check this out. 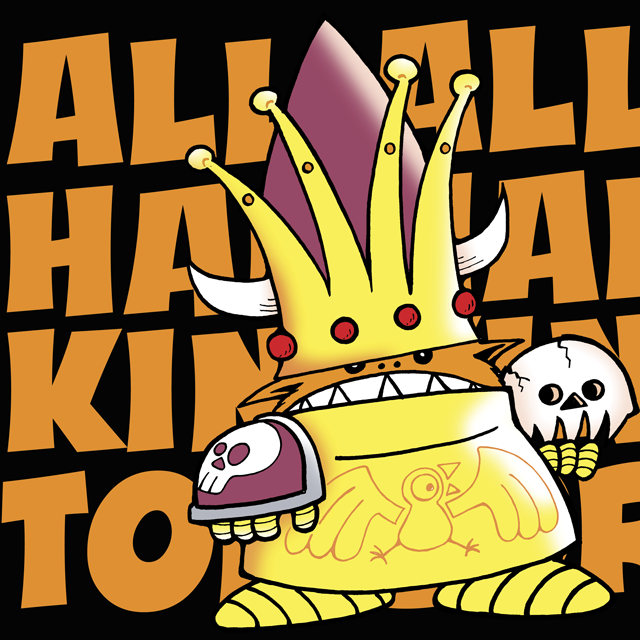 Whether you check it out or not though always remember, ALL HAIL KING TORG! Rulebook - For such a simple game, the rules don’t do the best job explaining things. Key words are bold and in a different font, which would be fine if it wasn’t every other word, which just makes it super distracting. Theme - Things really shine here! 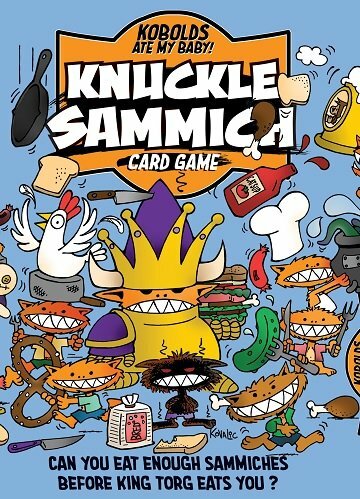 Knuckle Sammich is absolutely ridiculous, which is as it should be in a game where you play ravenous sammich stealing little monsters. Set-up/Take down - Very little here, just shuffle a deck and go. Components - This game feels and looks great! The art is fantastically endearing, the cards are a good stock, and the sammich tokens have a nice weight to them. It’s also it’s got a really sturdy box (flimsy boxes are a huge pet peeve of mine).